You may look at hundreds of systems, cheap or expensive, study with dozens of gurus, genuine and fake, or spend the money and time on reading hundreds of books on trading and investing. All of these have, in my opinion, only one value for most people. They teach you that you cannot use them. And that is a great lesson, which you will never learn until you have learned it. What do I mean you cannot use them? Simply this. Trading cannot be taught the way carpentry, flying jets or neurosurgery can. (Richard Dennis to the contrary -- what he did was carefully pre-screen 1,000 candidates down to 10 and then trained those 10. What this proves is that selected people can be taught a skill, and among those a few turn out to be really good it at. It's the same with carpentry, jets, law or surgery -- one out of ten are truly first rate -- the rest are mediocre to disasters. Trading is the same. The oft cited numbers are that 90% of traders loss money. The other 10% take the money the losers lose.) After a while, the true value of looking at many systems, methods and philosophies, is the learner begins to find what it is that begins to fit his or her own personality. You are not able to buy trading success. You have to make it yourself. It comes from within. You cannot buy success in a trading system. What works well for the honest vendor (and there are some -- they will give you copies of their brokerage statements) will not work for the average system or method buyer. The buyer will do one of two things. He (she) will not take all the trades, or will take them all until a bad spell hits, then give up. The buyer's personality is not the vendor's. What the vendor's record says, this system worked for this vendor during this period of time. That's completely all it says. It says nothing about how it will work for that buyer in that different time and place. There are as many trading methods as there are personalities trading in the markets. In St. Paul's day, the Greeks used to walk around the agora and ask each other in the power language of the time, "Quid novi?" -- what's new? It's so easy to discard an old system and try another new one instead (which promises your money-back in 30 days if you don't find success). I am afraid many traders do this their whole lifetimes. The few who break out of the pattern finally stop walking around the agora trying everything new, withdraw into themselves and build their own, usually simple, trading approach which, eureka! works well enough to make them a living or a fortune. (They are the one out of ten persons mentioned above). Another very important point, even if you join the limited group of successful traders, there come periods some of the time when what you do doesn't work at all well. For some traders what they do doesn't seem to work any of the time. For others, it comes and goes. Coming and going suggests possibly a cycle or cycles in your own personality behavior or in the way in which from time to time you (probably) unconsciously change your inter-reaction with the markets. There are not only cycles in the market. There are cycles in the way you respond to the markets. I double that they can be stopped. The best thing you can do is step back and observe both of them, yours and the market's, as a third-party observer, and relax into keeping them in balance all the time. I read an article by a student trader who started out in 1987 and made all the classic mistakes, spending and loosing a lot of money. In his relating his story, he went right by his biggest mistake of all. At one period, he simply withdrew, stopped trading, and simply studied the markets for a year, then recommenced trading and ran his stake up to four times what he started with that time around. Then he made his mistake. He figured he needed more education. So he spent thousands of dollars with a series of individual gurus (the kind who invite you to spend a couple of trading days or a weekend with them personally, one on one) until all the money he had made was gone. That was his biggest mistake of all: not stopping when he found for himself a system that worked for him! The "quid novi" syndrome had set in. He had to find something new and better. Now, he is still looking, like most, at the next new thing (for him, astronomy and planetary data -- more on that in a minute). His saga is Everyman's. Looking, looking. Wise traders say there is no "Holy Grail. We don't believe them. Just keep looking. It's there. Someone has found it. And I will buy it from him. (Isn't it wonderful that he would sell it to me! What a guy!) Or I will find it myself. We flew to the moon, didn't we. For thousands of years, everyone knew that couldn't be done. Then someone did it. The parallel stops cold right there. There are a number of limited, different ways to get to the moon. But all of them are buildups from the fixed, clear laws of physics and chemistry. Like carpentry, neurosurgery or jet flight. There are only a limited number of real ways you can do these things ... because they are in the physical realm. (Same with the profession of Law. It has a fixed, codified stricture within which its practitioners wield their skills, or lack of them.) 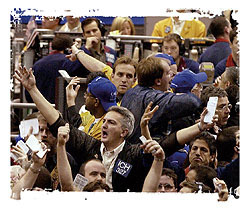 But with trading, the only physical structure is the exchanges and the pits wherein each participant's unique personality offers his or her own unique expression. That's what can't be taught. What's the value, then, of all the stuff beginners (and some veterans also) buy, and go to, and look at? They offer pieces of patterns which may eventually fit, transformed, into the trader's personality. They are sources for bits of ideas out of which a trader may create his own unique trading approach to the markets, an interior part of him that he is comfortable with, and that he makes money with. Like everything else in the universe, the markets are constantly changing (evolving) and constantly remaining the same. Adapt or die, as they say. But the adaptation must be a consistent personality match of yourself with your chosen course of action. You can't buy that. You have to elicit it from within yourself. As a footnote, planetary data is worth paying some attention to. This thesis may, or may not, fit your personality. No doubt it does work for some because it's a personality fit for them. Others think it's all investment quackery. It's not my place to debate that here. However, I offer a few comments. One senior international portfolio manager I know has gotten excellent results using planetary correlations. But a big problem from my viewpoint is there has been very little rigorous literature on the subject. There are some short trading records (all hypothetical that I have seen) but they suffer from the same limitations I mentioned above -- they are valid only for that one trader during a given specific period. Most of the literature is just promotional and marketing material lacking any scientific statistical backup. One exception: I came across a book years ago--now out of print -- by Clifford Matlock, titled Man and Cosmos. It is an excellent treatise on the whole subject of stock market prices and planetary excursions, rigorously statistical and elegantly presented. Don't let the title put you off. The essence of the book is what happens to the stock market (also applicable to commodities) when each planet makes certain moves or new aspects. Matlock was a career diplomat with the US State Dept and served in various capitals around the world after graduating from Stanford and Harvard. He found the time to develop an amazing body of factual research into the subject. The book is extraordinary. Well worth reading simply to broaden one's horizons even without any idea of attempting to apply its information to trading commodities or stocks. He gave me several copies some years ago, and I still have a few copies left.